In the heart of a centenary olive grove (1 hectare and secure) on a hill Manosquine, scented with scents of Provence, in peace (WITHOUT ANY NEIGHBORHOOD AND 5 MINUTES FROM MANOSQUE), come and relax in this corner of paradise in the land of Jean GIONO. We offer a new cottage of 50 m2 consisting of 2 bedrooms (including 1 living room / bedroom) with their respective bathroom / WC. The 2 bedrooms are equipped with TRUE XL BED in 160 very comfortable and new. A luxury cabin in the trees and its private terrace with stunning views can accommodate 2 children (2 beds of 90X190) who will want to live a dream vacation. The cottage has a kitchenette with 1 washing machine (3 kg) and a small dining area. You will enjoy outside a large and beautiful private arbor (waterproof) with its garden, its summer kitchen overlooking the Provence and the heated water, and another terrace for the breakfast in the morning at sunrise. The private exteriors to rent the cottage represent 2000 M 2. The cottage is the only rental of the Estate, it has its private entrance, it is attached to the main house and it is against the bottom with a few steps. The cottage is very nice, warm, and you will enjoy its interior cocoon. The highlight and charm of this rental are the location of the cottage because you will not suffer from the heat wave in summer and enjoy the panoramic view of Provence (Verdon, Plateau Valensole, Ste Victoire, etc ... N ' Feel free to contact me it is with great pleasure that I will give you more details. The comfort of the cottage is that it can accommodate 2 couples or 1 couple with 2 children. For children who love nature, the tree house with its terrace can accommodate 2 children only from 9 years old. The 2 bedrooms of the cottage have their bathroom / WC and cupboard respectively .Contact me at 0784966311 to refine the presentation of the exceptional exteriors of the rental, the plan of water (heated from June 15 to September 15 see more so good weather conditions). No reservation will be made without a telephone exchange in advance. You can watch a video of the property after scrolling through the first 2 photos of the rental. The house is an old restored 1860 cottage with an extension where you reside. You will have the opportunity to enjoy the 4 very beautiful and pleasant outdoor terraces (private) very different. 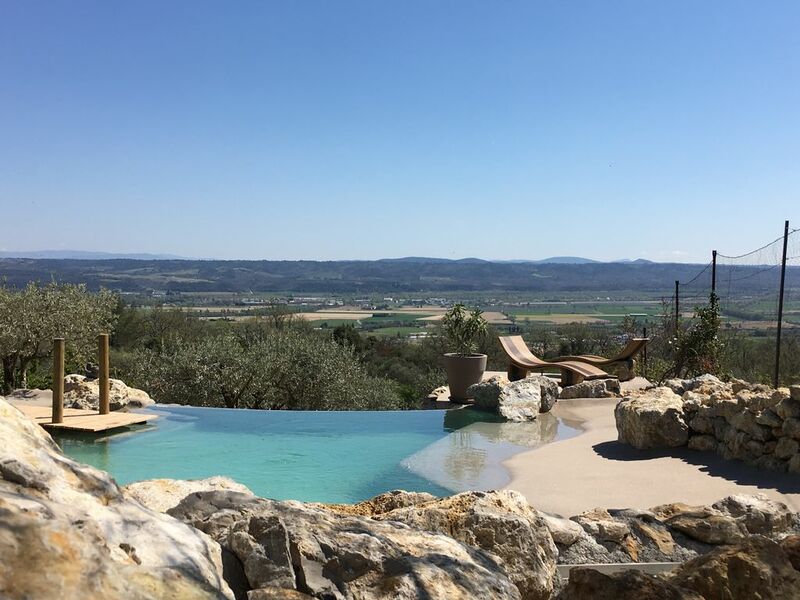 You will be immersed in an olive grove of one hectare (250 feet of olive trees) on a hill, 5 minutes from Manosque by car (essential) and will have the pleasure of meeting chickens, donkeys, dwarf goat, garden and orchard . You will appreciate the walks on the hill, (without taking the car) the village of Pierrevert, the Chapel of All Aures (listed historical monument), as well as mountain bike rides. Visit Manosque and the historic, shady squares enjoying a cool pastis, which Occitane boutiques with the scents for its cosmetic products, its Saturday market, restaurants, churches, museums, home of Giono, doors Saunerie and Soubeyran. And a few minutes from the city, Lake Vannades, landscaped, to cool off on its body of water. In its surroundings you will discover the landscapes of Provence with Dauphin, Mane, Lurs (village of character), St Michel The observatory with the possibility of going to observe the stars, Gréoux the baths (thermal city), the lake of Esparon ( a marvel of nature), Forcalquier with all its craftsmen, scents and fresh products on Monday in its picturesque market. AOC goat cheese from Banon through its famous bookstore 'Le Bleuet' then the Gorges du Verdon and its largest canyon in Europe to visit by canoe or pedalo, Moustiers and porcelain, the Golf Pierrevert where you can also you are restoring at the terrace of his restaurant. Do not forget to stop at the Blaque Domain and Domain Régusse to taste good rosés from Provence. Then you can marvel at the Plateau de Valensole with its blue expanses of fragrant lavender and wheat fields. In September, connections Manosque will make you share the passion of writing and literature with very great writers. And side Luberon, you can walk the ocher of Roussillon, Gordes, Avignon and its festival, Fontaine de Vaucluse, L'ile sur la Sorgue, Orange and chorégies. Back from these long walks, you can cool off in the pool, relax in the bubble area and relax on the sandy beaches enjoying a cool rosé in front of the panoramic view, the Verdon, Valensole, and sometimes with a bit of luck from Ste Victoire. Location Location! Only 5 minutes drive from the centre of Manosque the site is on a beautiful hilltop with amazing uninterrupted views of the valley and distant mountains. The main feature for us during a short stay was the total seclusion and privacy, with no outside noise apart from the occasional visits from the friendly dog, donkeys, chickens, goat and sheep who only added to whole wonderful experience. Our wonderful hosts Maryse and Mathys who live onsite were amazingly friendly, available if needed, helpful and generous with flavourful and fresh food gifts, yet in way no did they interrupt the overall peace and outside areas. Most of our time was spent in the outside living areas with the large variety of seating including hammocks and sun loungers in the olive orchards. The indoor accommodation was modern, comfortable and clean. There is so much to see locally including the large towns, gorges, quiet picturesque villages and the best market we have ever visited at nearby Forcalquier. This was our most enjoyable and memorable holiday for many years and we hope to visit again soon. Thank you Maryse and Mathys for a wonderful experience. Nous avons adoré notre séjour dans ce coin de paradis. On se croirait seul au monde au cœur de la nature bercé par le chant des cigales et un bonjour ponctuel de Gospel et Anaïs, les ânes, de chaussette la chèvre et de "Léon" (le paon). Maryse et Mathys sont au petit soin avec leurs locataires, avec des conseils de coins à visiter et des petites attentions (croissants, œufs de leurs poules super bons, dégustation du miel de la région) que nous avons bien appréciées. On vit dehors en permanence...le bonheur pour les amateurs de Nature ! La piscine est superbe et permet de profiter d'une vue exceptionnelle (cfr photo). On peut se reposer au gré de ses envies (transat, hamac ou fauteuil suspendu ou encore salon sous la pergola) ...Tout le monde y trouve son compte. Bonne literie dans le gîte. Les enfants ont adoré dormir dans la cabane de trappeur, partager des moments de jeux avec Mathys (ping-pong, vélo, foot, pétanque) et câliner Pitoufa, leur gentille chienne. Bravo à Maryse et Mathys pour ce coin de paradis et merci pour l'acceuil. Tout cela nous manque déjà ;-) et nous espérons y retourner l'année prochaine ! the studio is perfect for 2, okay for 4 as the living room has also a bed for 2. There are also 2 bathrooms, but a very small kitchen; we did not use it, and cooked outside. Light is coming through 4 light dwell (?) so no feeling of reclusion. Around Manosque is enough to spend two busy weeks, between luberon, Valensole et les gorges du Verdon. Merci Sibylle et Laurent pour votre sympathique appréciation. Nous sommes contents de savoir que vous avez apprécié votre séjour et les lieux atypiques. Je voulais juste apporter une précision concernant le gite, le gite n'est pas un studio mais un T 2. L'entretien de la piscine ( piscine atypique ) journalier est de 1 à 2 h / jour avec un robot. Je demande aux vacanciers ( comme je vous l'ai demandé ), de m'informer de leurs absences afin d'effectuer l'entretien de la piscine. Je m'adapte aux vacanciers, je ne pense pas pouvoir faire mieux, en terme de confort pour les vacanciers, afin que l'entretien de la piscine ne soit pas un poids. Nous vous souhaitons une belle fin d'été. J'ai passé une semaine de vacances merveilleuse dans ce gîte avec ma famille. La photo pourrait parler d'elle-même mais il y a aussi les oliviers, un jardin magnifique, le calme et une qualité d'accueil vraiment irréprochable. Tout est mis en oeuvre pour un séjour de rêve: une cuisine d'été aménagée à deux pas de la piscine, des hamacs, des transats et petit plus dans cette région chaude en été, le gîte reste frais même quand la température monte. Nous avons quitté à regret ce havre de paix et gardons un excellent souvenir de nos hôtes. Magnifique séjour dans l'oliveraie ! Nous avons passé un magnifique séjour dans cet endroit invitant à la détente et au repos. La vue est splendide, la piscine très agréable, les lieux sont magiques. Tout y est pensé, il n'y manque rien! Maryse est au petit soin, Mathys est super. Tous les deux aiment partager l'amour qu'ils ont pour leur maison et leur région. Nous sommes comblés en quittant les lieux et espérons revenir au plus vite !